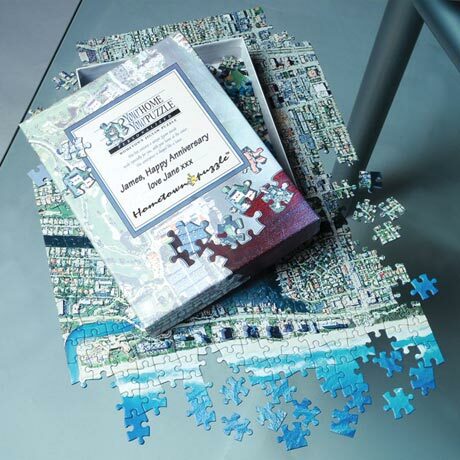 Imagine the fun of working a jigsaw puzzle centered on your home. Made from a United States Geological Survey map, the 400-piece puzzle shows main roads, contour lines, water features, vegetation, and notable buildings and structures. At the center is a house-shaped piece representing your address. Completed 18 1/4" x 12 1/4" puzzle shows an area measuring 6 miles from east to west, 4 miles from north to south. Satellite Image zooms in even closer to 1 1/2 miles east to west, 1 mile north to south. Arrives in a presentation box with space for a personal message. Specify recipient's full postal address including street number and name, city, state/province, and ZIP/postal code. Allow 2-3 weeks for delivery. No rush delivery or gift box. Order by April 28, 2019 for Mother's Day delivery.